We’d love your help. Let us know what’s wrong with this preview of Gone to New York by Ian Frazier. To ask other readers questions about Gone to New York, please sign up. Random thoughts, descriptions, observations and few pieces of history about a city; what could be a better read each morning on the bus en route to work. Bags in trees. The obsession with bag removal was something I could relate to. The authors’ descriptions of his observations were so crystal clear in my head, especially his description of an early morning walk under the El. Antipodes and typewriter man were my two favorites. Something about typewriter man made me want to run out pick up an old Random thoughts, descriptions, observations and few pieces of history about a city; what could be a better read each morning on the bus en route to work. Bags in trees. The obsession with bag removal was something I could relate to. The authors’ descriptions of his observations were so crystal clear in my head, especially his description of an early morning walk under the El. Antipodes and typewriter man were my two favorites. Something about typewriter man made me want to run out pick up an older typewriter that I could set out and use for those moments when the printer on the computer is way too cumbersome. For instance, printing an address on an envelope. If nothing else, the typewriter cannot be beaten when it comes to addressing one or two envelopes. And the appeal of imperfectly aligned type stimulates the senses. Each typewriter is a manufactured machine one is like the other, yet each has unique characteristics that give it individuality separating itself from the others. Canal Street was also interesting. I was fascinated with the short history lesson of the construction of the Holland tunnel. My interest is probably a combination of it being an architectural engineering feat similar to that of the grand bridges. And the designer was another who spent his life contributing to the built environment only to end up in a sanitarium in Michigan. Not sure which is my true felt connection, that he died in Michigan or that he worked himself crazy slowly destroying his bodies’ ability to keep going. He loved his work. Tangent, do you know what a Sandhog is? A quick little read. I think I finished this book in one day. I would hate to buy a book like this, as it’s just a collection of previously published magazine articles. But from the library, sure, why not! They are little stories over like 30 yrs from someone who moved to NYC from the Midwest and just their stuff. Stuff like this can be lame most of the time, but since this was a quick, easy, PAINLESS read, I’ll accept it. The writer lived in different parts of the city (including by the end whe A quick little read. I think I finished this book in one day. I would hate to buy a book like this, as it’s just a collection of previously published magazine articles. But from the library, sure, why not! They are little stories over like 30 yrs from someone who moved to NYC from the Midwest and just their stuff. Stuff like this can be lame most of the time, but since this was a quick, easy, PAINLESS read, I’ll accept it. The writer lived in different parts of the city (including by the end when he had a family, JERSEY! EW!) which I liked a lot and I think says a lot about a persons lifestyle and the time of their life. Lower east side in some dingy walk up above immigrant stores when they first move. Park slope in bklyn when they have grown up a little and have more money. And of course, the inevitable move to Jersey with your family. As someone interested in any reportage to do with NYC, this book would have to have been pretty bad for me not to enjoy it. I'd already read extracts from it in Heather Reyes' 'City Picks' book on the city, so knew to some extent what to expect, and I more or less got this, in a number of articles written for newspapers and magazines about Frazier's life in and around the city. The quirkier articles included several about plastic bags caught in the trees around the city, but these were offset by As someone interested in any reportage to do with NYC, this book would have to have been pretty bad for me not to enjoy it. I'd already read extracts from it in Heather Reyes' 'City Picks' book on the city, so knew to some extent what to expect, and I more or less got this, in a number of articles written for newspapers and magazines about Frazier's life in and around the city. The quirkier articles included several about plastic bags caught in the trees around the city, but these were offset by some excellent articles about the likes of life on Canal Street, experiences in Brooklyn and the making of the Holland Tunnel. My response to each in this collection fell into one of three buckets for me: "Eh, I don't care"; "Hmm, interesting"; and "Gem". Sadly, only a small handful fell into the last bucket -- but those that are gems are real gems. My biggest disappointment in the book is how little the book felt to me like it was about NYC. I hate how disrespectful this sounds, but the book was right for its place in my literary life: I saw it on a cart of used books outside a bookstore near my office. At lunchtime, wh My response to each in this collection fell into one of three buckets for me: "Eh, I don't care"; "Hmm, interesting"; and "Gem". Sadly, only a small handful fell into the last bucket -- but those that are gems are real gems. My biggest disappointment in the book is how little the book felt to me like it was about NYC. I have enjoyed the musings of Ian Frazier over the years in the New Yorker and now Outside magazine. So I was surprised when at times I lost interest in this collection. However it does offer a few gems. Uneven overall, but there are enough gems that it's worth checking out. My personal favorite is the one about Rt. 3 in New Jersey (and not only for the imagery of a New Yorker writer fighting his way through the wild vegetation alongside a busy New Jersey highway). An uneven collection of essays that nonetheless becomes an engaging portrait of the New York city area as drawn by a transplanted small-town boy. I'm reading this book in preparation for my trip to NYC. It's a hilarious and quirky introduction to my destination. 1993 was a particularly funny year for this author. At the Brooklyn Museum he copies his favorite passages left during the Frederic Bazille exhibition. The contrast between "Bravo! Beautifully executed & a sensitive touching exhibit." and "Bravo! Idiotic pretension and lousy painting." was my favorite. The quote from George Willig, the man who climbed the World Trade Center in I'm reading this book in preparation for my trip to NYC. It's a hilarious and quirky introduction to my destination. Ian Frazier is a staff writer at the New Yorker, where he began his career over 30 years ago. In April 2005, he revisited the legacies of Baghdad's historical invaders. ?It seems that so much of the foolish and horrible things that people do come from being adrift in the world,? Frazier told me. Against that, a book is ?an efficient way to record something? ? to situate a person or an era. Frazier's non-fiction includes chronicles of family, the Pine Ridge Indian Reservation and the Great Plains. He lives in New Jersey, and is currently at work on a book about Siberia. Stop Smiling: There's an article in your recent collection about walking in New York in a place where a violent crime occurred. Over time, the memorials and the record of what happened there become less and less. Does it seem that that happens all too quickly? That it's forgotten and becomes just a place again? Or is that a necessary reaction? Ian Frazier: You end up with so much ? the weight of the past is so huge ? that sometimes you want to forget it. America was founded on that ? the idea that, well, we're not going to worry about the stuff that happened before we got here. A lot of the country is a place where, especially out West, you're beginning anew. Nobody cares who you were in Philadelphia. You're in Wyoming now, and whoever you are is who you're going to be. Not who you were before. There's a parallel phenomenon that I noticed when I was doing the book about my family. The people who know their ancestry usually have children who want to marry somebody who doesn't know his or her ancestry. You get so fed up that you want to marry someone who says, ?Yeah, I know who my grandfather was, but before that, I don't.? That, I think, is a natural phenomenon that naturally limits the amount of information that you have. If both sides of your family save everything and know everything, as a kid you get that and you're buried under it. Physically. It's such a huge amount of stuff. The amount of stuff that physically I took from my parents' apartment when they died is a lot. If you imagine that piling up over generations, pretty soon someone's going to have a house that's full of nothing but handwritten genealogies. I picked this up after an event at which Ian "Sandy" Frazier read. At the event, he had me laughing so hard that tears were rolling down my face. So, imagine my surprise when I began reading this collection of essays and found a more serious tone. And imagine my further surprise, when I discovered this different voice of Frazier's was infinitely more poignant. The book contains essays about New York City, and they are marvelous. I told a friend of mine, who used to live in the City that she shoul I picked this up after an event at which Ian "Sandy" Frazier read. At the event, he had me laughing so hard that tears were rolling down my face. So, imagine my surprise when I began reading this collection of essays and found a more serious tone. And imagine my further surprise, when I discovered this different voice of Frazier's was infinitely more poignant. The book contains essays about New York City, and they are marvelous. I told a friend of mine, who used to live in the City that she should read the book, and her response was "Does it talk about how crappy the City is?" (She didn't enjoy her stay here, by the way.) Well, the answer to that is no. But an equally fair question (and one that receives the same answer as the first question is "Does it talk about how great the City is?" The essays are filled not with great praise or harsh criticisms, they are simply written, with honest admissions and fascinating observations. I assume that one could argue Frazier's lauding the City simply by compiling a collection of essays about it, but I don't think that would be fair. He doesn't clean things up to make the City any better or worse than it is, he simply does his best to call a spade a spade. And, in large part, I feel like what his observations point out illuminate much of what I feel about the City. There's a balance to this place, more than I think I've noticed in any other place I've lived. There are things about New York that are truly amazing and you feel almost humbled by being in a place that offers such a wide range of experiences. Equally true, though, is that there is much to dislike about the City. It's far from perfect. And the resounding sentiment of those who live here (and plan to keep living here) is that the balance is well in favor of the good things. (Perhaps they are the 70%/30% people.) Those who live (like my friend) are more like 30%/70% people. It's a matter of taste. What is it about Fraser's writing that makes me want to learn more about whatever subject he is writing about? I have the same reaction when reading John McPhee. This book made me want to learn more about the Holland Tunnel, and just about any other subject he wrote about. A lot of other writers would put me to sleep if I read an essay about the Holland tunnel, but not Ian Fraser. I do think that the title is a bit deceptive. The book is not so much "about" New York itself, as it is how the city What is it about Fraser's writing that makes me want to learn more about whatever subject he is writing about? I have the same reaction when reading John McPhee. This book made me want to learn more about the Holland Tunnel, and just about any other subject he wrote about. A lot of other writers would put me to sleep if I read an essay about the Holland tunnel, but not Ian Fraser. I do think that the title is a bit deceptive. The book is not so much "about" New York itself, as it is how the city has changed him over the years. So don't expect to get a collection of travel essays or a good guide to the city from this book. It's a very personal journey about how a place can change a person. So this non fiction book is pretty good. Mr. Frazier writes in such a style that you can tell he is passionate about something: he is passionate about New York. He believes that city has a story to tell and indeed, he is not wrong. My personal favorite story is "The Morning After"--about 9/11. It sounds morbid and strange to say that was my favorite title in this volume, but it is the truth. There is an honesty and vulnerability that shares many of the same emotions I felt. But his are more "aliv So this non fiction book is pretty good. Mr. Frazier writes in such a style that you can tell he is passionate about something: he is passionate about New York. He believes that city has a story to tell and indeed, he is not wrong. I think I have encountered the drawback to the essay. They have an expiration date. I would say this gets a mixed review for me. There were some good pieces and one that stood out for me, but for the most part they were flat and fillerish. I had pickled this up for two reasons: My current fixation with essays and my pending trip to NYC. I thought this might just be the ticket. I think I would have been better of going back and reading Slaves of New York by Tama Janowitz. I am not going to be runni I think I have encountered the drawback to the essay. They have an expiration date. A collection of short pieces by the writer from The New Yorker about the wide variety of place and people found in that city. Topics include the building of the Holland Tunnel, a man who has repaired and refashioned manual typewriters for a living for over fifty years, the author's obsession with plastic bags caught in tree branches and freeing them, and finding the site of the Burr-Hamilton duel in New Jersey. And much more. Really good stuff. (3.75 stars). Frazier is at his best in the longer pieces, where he serves as a charming tour guide, both urbane and eccentric. The four best essays here share the same building blocks: gentle humor, a flaneur's keen eye, and the dual perspective of someone who is both a New Yorker and yet not a New Yorker. "Canal Street," "Take the F" (Brooklyn), "Someplace in Queens," and "Route 3" (Weekhawken/Seacaucus, NJ) are what anchor the collection. I loved New York but the same can be said for “Gone to New York”. The facts and figures can’t rescue a boring topic. After the first try I just didn’t want to pick this up on my morning commute for the rest of the week but powered through. I’m giving Ian Frazier’s essays just 1 star. I took this book from the shelf at the store because I liked the color. I flipped through the first few pages, and I was caught. I'm not sure why it so appeals to me. Maybe it's because Frazier's observations seem to capture elements of the city so well; maybe it's just because I like his writing style. Either way, I only put the book down last night because dinner called. It took too little time to finish reading today. Although listed as travel by my library, this actually is a collection of mostly personal reflections of his life in New York (as well as NJ and Ohio), that while not overtly humorous is funny in many ways and, I thought, heartwarming. I really enjoyed it. He mixes in a little history and description of community; having never been to New York, I found it fascinating. I have read him in The New Yorker, and am glad I picked up this collection. I think you will too. This book was average. The only interesting bits were the chapters written about Brooklyn, but only because the author lived in my neighborhood and I was familiar with what he was talking about. NY is a tough place to write about because of the vast array of experiences to be had here. It's not enough to be able to chronicle the neurosis of the residents. An excellent compilations of short essays! If you haven't read Ian Frazier before you need to start now. I hadn't read him before and I had no idea what I was missing. I now look to the future and all the Frazier ahead to be invested in. If you have any suggestions for what to read next of his please let me know. I've enjoyed Ian Frazier's pieces in the New Yorker and found this collection about New York City quite entertaining. He is funny and he paints some great images of people and places in the city. He crafts some great sentences. 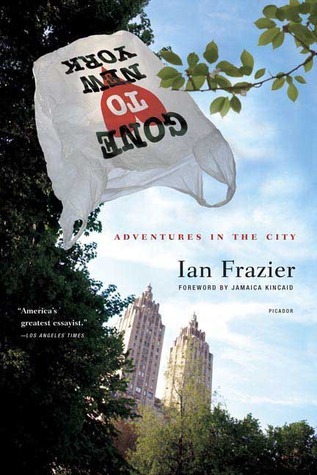 There are three stories in this collection about Frazier's pursuit of errant plastic bags stuck high in trees. Make sure to read them all! Recommends it for: those who like reflecting on life. I like the art on the cover of my copy better--it's a sketch of skyscrapers looking down from above, and they form a heart shape between them. I lovely book of musings about life in the city. It kept me good company on a bus ride to Boston, and is now lost somewhere around my bed. I'd give this a 3 1/2 stars. Some of the stories were a little too all over the place and had a "free association" feel to it. Others were quite exceptional. All the stories though, in some way, brought back the NY of my childhood. Enjoyable read.